Prepare to say WOW and offer your group an exceptional experience above the rest as you knock another state off your bucket list with a trip to the most exhilarating slot machine experience in the Southwest, Choctaw Casino in Durant Oklahoma! With an exceptional selection of more than 4,100 exciting slots, to action-packed popular table games, find your WOW moment with The District, featuring a 3,600 ft² arcade with 40 plus games, a 20 lane Bowling Center, District Cinema, and a 2-story Laser Tag Arena, hosting fun for all ages. Great for family and friends and business outings, enjoy shopping and so much more as you partake in fun-filled casino games and entertainment! This private tour accommodates small groups of up to 11 passengers, and also includes complimentary pickup from your local DFW area home/ hotel, or local airport. Featuring a 3,600 ft² arcade with 40 plus games and a redemption counter for your gaming enjoyment, also consisting of a 20 lane Bowling Center, the District Cinema with 4 auditoriums hosting blockbusters and first-run movies, and a 2-story Laser Tag Arena! Upon the time of departure, head back to the entrance (point of arrival) where your driver will be waiting. 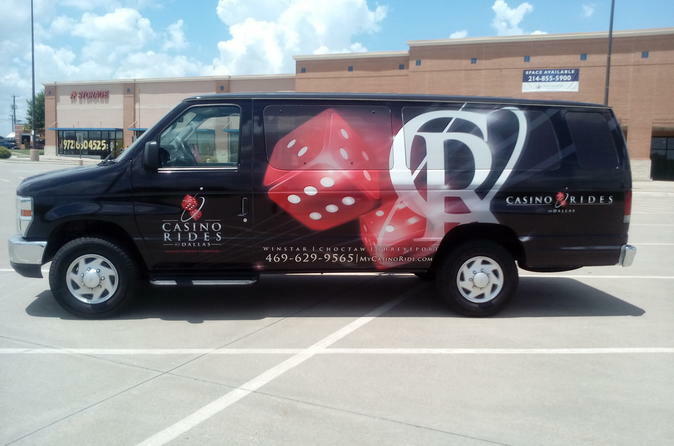 As you load back up on your shuttle, sit back and relax as you enjoy the incredible views and reminisce about your casino tour as you enjoy the worry-free road trip back to your original point of departure.